Vancouver, British Columbia--(Newsfile Corp. - January 14, 2019) - Great Bear Resources (TSXV: GBR) (the "Company" or "Great Bear") today provides a 3D model of gold mineralization drilled to-date at the Company's 100% owned Dixie project. All previously reported drill results from the Dixie Limb (DL), Hinge (DHZ), and South Limb (DSL) zones are provided, in addition to the primary geological units. Additionally, the Company reports that its fully-funded 30,000 metre, 150-drill hole program has resumed after a brief break for the holiday season. The Company will mobilize a second drill rig early in 2019 in order to more rapidly drill the known mineralized zones and simultaneously test new gold targets. Results will continue to be released in batches as received. A downloadable video of the model is provided on the Company's web site at www.greatbearresources.ca/presentation. A live webinar to be hosted by Great Bear's Director and Vice President, Exploration Mr. R. Bob Singh and Great Bear's President and CEO Mr. Chris Taylor reviewing the digital model and results to-date, will be held at 11:00am Pacific Time on Thursday January 17, 2019. Participation instructions are provided below. Mr. Taylor said, "Great Bear is completing a large number of drill holes throughout 2019 and 2020, totalling at least 30,000 metres. The Company is fully funded for this work and anticipates a very active sequence of news flow. 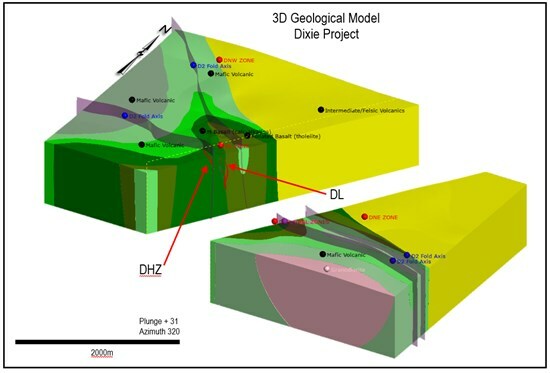 We are providing a video of our current geological model due to high investor demand, and so that shareholders may more easily monitor our progress as we continue to explore the multiple gold zones at our flagship Dixie project. We would also like to invite any interested shareholders and potential investors to listen to myself and our Director and Vice President of Exploration, Mr. Bob Singh provide a live webinar detailing our results to-date on Thursday January 17th." The Dixie property is located approximately 15 minutes' drive along Highway 105 from downtown Red Lake, Ontario. The Red Lake mining district has produced over 30,000,000 ounces of gold and is one of the premier mining districts in Canada, benefitting from major active mining operations including the Red Lake Gold Mine of Goldcorp Inc., plus modern infrastructure and a skilled workforce. The Dixie property covers a drill and geophysically defined multi-kilometre gold mineralized structure and newly discovered gold-mineralized vein systems similar to those hosting other producing gold mines in the district. In addition, Great Bear is also earning a 100% royalty-free interest in its West Madsen properties which total 3,860 hectares and are contiguous with Pure Gold Mining Inc.'s Madsen property. All of Great Bear's Red Lake projects are accessible year-round through existing roads. The model incorporates drill hole and geological data produced by Great Bear and historical data originating from a number of past explorers. Great Bear has conducted gyroscopic downhole surveys on its own drill holes which most accurately define their orientation, and continues to resurvey historical drill holes when these are located and are accessible for resurvey. The Company also continues to resurvey historical drill collar locations using a differential GPS as drill collars are located. Information regarding this work was provided in a news release on November 29, 2018. The Company has not undertaken a National Instrument 43-101 resource calculation and cautions that data provided in the 3D model is subject to change pending ongoing drilling and resurveying work. Drill core is logged and sampled in a secure core storage facility located in Red Lake Ontario. Core samples from the program are cut in half, using a diamond cutting saw, and are sent to Activation Laboratories Ltd. in Ancaster Ontario, and SGS Canada Inc. in Red Lake, Ontario, both of which are accredited mineral analysis laboratories, for analysis. All samples are analyzed for gold using standard Fire Assay-AA techniques. Samples returning over 3.0 g/t gold are analyzed utilizing standard Fire Assay-Gravimetric methods. Certified gold reference standards, blanks and field duplicates are routinely inserted into the sample stream, as part of Great Bear's quality control/quality assurance program (QA/QC). No QA/QC issues were noted with the results reported herein.